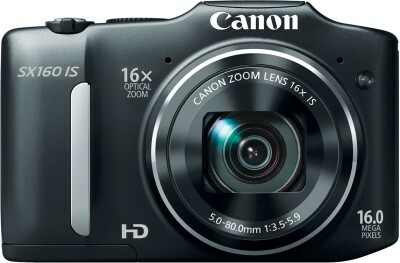 Get great discount on Canon PowerShot SX160 IS Point & Shoot Camera | Online India shopping best deals, discount,coupons,Free offers. With compact cameras, it becomes quite easy to carry it around, no matter where you go. The PowerShot camera by Canon is a great compact camera that can fit into your bag or loose pocket so that it always remains available when you need to click a quick snap. Zoom it Out With the incorporation of the 28 mm Wide-Angle Lens, you can get a 16 X Optical Zoom level on the camera, which can also go up to 32 X with Zoom Plus. The optical zoom results in high precision, quality images even from a distance as long as it does not progress into the digital zoom range. The in-built optical image stabilizer greatly reduces camera shakes so that you can easily achieve stunning photos and images. Automatic The Smart AUTO function is a very helpful mode in the compact camera as it allows even the most amateur photographer to achieve some of the best shots possible. This mode is incorporated so that you do not need to worry too much about exposure, focal length and other feature settings that DSLR users need to keep in mind. The Smart AUTO feature can intelligently select the ideal settings for the compact camera which is based on 32 predefined shooting scenarios that will ensure the best possible stills or videos. Media Capture With the optics already incorporated with the powerful image sensor, you can expect to take high quality 720 p videos with the 16.0 MP compact camera. The Canon DIGIC4 image processor delivers some stunning visuals thanks to the high image quality output. Apart from being able to record in 720 p, the camera is also able to record good quality stereo sound to go with the video files. Other Features With the high speed auto focus mode, you can take high quality images across a wide variety of situations. The auto focus mode works well with the optical image stabilizer and the result is a host of highly detailed shots that are derived from this camera. This also works well in terms of low light conditions since there is little need to boost the ISO sensitivity and risk noisy shots..The product Canon PowerShot SX160 IS Point & Shoot Camera is from the famous brand Canon. The product is currently available with the amazing discount from FlipKart.Currently a discount of 19.0% available for this product. Great discount for this product which has the original price of Rs.9995.0 and you get these amazing products for a discounted price of Rs.7999.0. Hurry up. Stock may be limited.